&quot;Stalin was personally responsible for the Purges in Russia in the 1930s&quot;. Agree or disagree? "Stalin was personally responsible for the Purges in Russia in the 1930s". Agree or disagree? In my opinion, this statement can not be definitely answered. However, I do have some certain facts and interpretations that can be deduced to construct an argument for this question. The expression 'purge' is defined as "to remove undesirable elements from..." and in my opinion, the term 'purge' in the context of Russia in the 1930s described exactly this. The Purges were the political method adopted by Stalin to rid himself of critics, potential rivals and their supporters. In Russia during 'the Great Terror' which lasted between 1928 and 1940, there were three major purges: the military purge which began in 1937, the NKVD purge which began in 1939 and the most major purge of all; the political purge, also known as the Yezhovschina, which began in 1936 up until 1938. I agree with the statement to a greater extent than to which I disagree with it, because this method of "cleansing" of opposition to Stalin's regime was evident even before the purges began. For example, 'collectivisation' and 'industrialisation' featured murder on a massive scale. In 1928, there was subtle evidence of opposition to Stalin and his plans when the peasantry did not agree with the 'collectivisation' and as a result thousands of Kulaks were executed and an estimated 5 million were deported to Siberia. In my opinion, this is evidence of Stalin's cruel, exaggerated tactics to handle opposition. ...read more. did not seem to please Stalin anymore (the novelty had worn off) and he was removed from his post and replaced immediately with Yezhov. This also ties in with another reason for the beginning of the purges. Stalin wanted total submission from his Party and the USSR and Iagoda was obviously not displaying enough persistence anymore, as he did not want to press charges against Rykov. This leads me to believe that Iagoda was removed due to the slightest hint of 'insubordination'. Furthermore, one person who would witness the 'real' Stalin, for example, his habits, plans and complete personality would be family members. Therefore I believe Stalin had a ruthless personality and he was mainly, if not completely responsible for the purges. My evidence is that his wife committed suicide after she openly criticised him for the suffering collectivisation had caused countless Soviet peasants. These desperate, dramatic actions demonstrate her fear of Stalin. She of all people would witness that he was capable to be vicious and that her criticism was a fatal mistake. Another factor to show Stalin's personal responsibility, is that the 'show trials' were a legal process, therefore how did Stalin not know they were happening. Furthermore, several of these trials were held in Moscow as an example for the trials of local courts. How did Stalin not become aware of this, they were being held in the capital city! The 'show trials' allowed the NKVD to execute whoever was suspected of treason. The NKVD prepared lists of people it proposed having shot or sentenced to long prison terms. ...read more. I also believe that he was responsible for Kirov's death. It set off a chain of events which culminated in the Great Terror. I believe Stalin was in need of a pretext to launch a broad purge and he evidently decided that murdering or having Kirov murdered would be expedient. This also enhances my judgement that he wanted to rid himself of opposition, as Kirov was popular and urged to challenge Stalin for leadership, therefore he was Stalin's definition of opposition and a threat. The murder would have been "killing two birds with one stone". However, I am also undecided whether Stalin was personally responsible, because if Stalin was indeed solely responsible and had enough power to control the killing of 30 million people, then why did he have any opposition at all? Furthermore, Stalin's daughter agreed her father had a paranoid personality, but she believed it was poisoned by men around him, such as Yezhov, so he saw threats everywhere. This also ties in with the factor that the methods used by the NKVD may not have been Stalin's idea. For example, it was the NKVD who pushed to be able to lower the death penalty which could be applied to the traitors' families down to the age of 12. Overall, I believe that it is completely evident that Stalin was responsible for the Purges, even if he did not invent the methods or suggest them to the NKVD; he was the leader of the Party and the state and therefore had the overall control of matters and effects that came about. 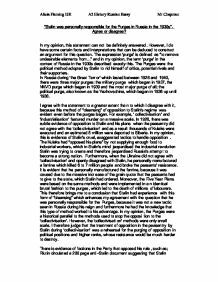 Alicia Fleming 13E A2 History Russian Essay Mr Chapman ...read more. was the reason the Bolsheviks came to power after the 1917 Revolution. Stalin made himself look as if he was as important to Russia's history as Lenin was, and many pictures showed them as friends, even though they rarely met. In the past, this had created major problems; whenever there had been a bad harvest or when the peasants did not produce enough food. * Stalin did not want the new Socialist State to be at the mercy of the peasantry. The younger generation of workers still held ideals of the Promised Land and of a better society, even if it meant a few years of hardship. Bonuses were awarded to the most efficient workers, who were referred to as Stakhanovites. Stalin wanted to introduce industrialisation so rapidly because he felt that Russia was already 50 to 100 years behind the west and in order to close this gap he introduced the five year plans. Stalin believed that to develop industry and run the economy, there should be state planning. They both agree in reflecting what the show trials consequences were. These consequences have been reflected in source I were all these men are declaring themselves guilty of a crime they probably haven�t committed and as the hangman�s noose shows they are gaining to be executed for it. This was beneficial as it allowed Stalin to make all of the decisions that he needed to make in order to achieve his policy of catching up with the west. The forced pace of industrialisation and the implementation of collective farming in order to achieve his economic aims required a disciplined workforce and a compliant peasantry. Writers were also kept under strict control and were forced to promote the state and Stalin?s policies. The cult of personality also included his statues everywhere and cites were named after him such as Tsaritsyn became Stalingrad. He did not only control the arts but also the media to project a positive image of him.